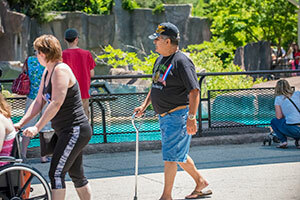 The Milwaukee County Zoo is hosting Military/Veterans Family Day on Sunday, July 2, 2017 from 9 a.m. to 5 p.m. Military service members, veterans and their families can enjoy free admission and parking at the Milwaukee County Zoo. Tickets are required for entry, and are available now until June 30. They can be picked up at your local County Veterans Service Office (CVSO). Contact your local CVSO for details on ticket pick up. Tickets are available for immediate family only, and are limited to 10 tickets per family. Also, don’t miss the Veterans Benefits Expo, sponsored by the Milwaukee County Department of Veterans Service Office, presented in the U.S. Bank Gathering Place from 9 a.m. to 4 p.m. This unique “one-stop shop” invites veterans to learn more about applying for and receiving military benefits.